This monograph of a mere 72 pages documents all of the German zeppelins that were built, operated, and lost in the first 17 months of the Great War. Profusely illustrated with photographs, scale drawings, a table listing military zeppelins and a map of Western Front naval bases and army sheds, the author has compiled a remarkable account of waging war with lighter-than-air vessels. 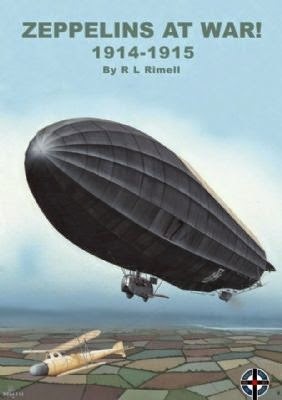 The illustrations describe the advances in control surfaces, graceful flights and landings, the immense sheds needed to house 450-foot airships and also the shattered remnants of zeppelins brought down by weather, anti-aircraft fire, bombs dropped by aircraft, and the misfortunes of war. Zeppelins had short lives terminated by violent deaths. Zeppelins at War is peppered with personal anecdotes of crew members describing wartime assaults on Allied targets, particularly English cities. Other raids are described based on official reports and other documentation. Zeppelins had the advantages of a long range, large bomb loads, and the ability to reach relatively high altitudes but were subject to fog, inclement weather, structural failure, poor navigational capabilities, dud bombs, fragile construction, and fickle and sometimes ferocious winds. Flying a zeppelin was not for the faint of heart. Defenses against zeppelins are given some attention in this booklet, but more explanation would be nice. One early method was to fly over a zepp and drop bombs on it. This ignited the hydrogen cells causing the airship to burn furiously and crash. LZ37 in July 1915 suffered just that fate, and the recollection of the lone survivor along with the attacking pilot are highlights of the booklet. So important was this air victory that the King telegraphed the pilot to award him the VC. Attempts would be made to shoot down zepps, but bullets would pass through the gas cells without damaging the aircraft. Eventually it would be realized that without oxygen the hot bullets could not ignite hydrogen. Later ordinance would overcome that problem and zepps would be shot down. While the author provides much information about individual battles and bomb strikes, he does not comment on the impact zepps had upon the war overall. Perhaps that will come in future booklets. Overall, Zeppelins at War is informative about waging war with zepps, their advantages and difficulties, and their use by the German command. The booklet fills a gap left by other sources which have not covered this subject with nearly as much detail, much less enthusiasm. Highly recommended to anyone interested in the air war from 1914 to 1915. This is a very helpful review of what promises to be a fascinating publication. As the reviewer states, it would be nice to have follow-up monographs that expand the subject.